A Waikīkī historic home walking tour from the Historic Hawaiʻi Foundation is a self-guided itinerary, suitable for individual travelers, and focuses on sites of historic or cultural significance that are either open to the public or visible from the public way. The Historic Homes in Waikīkī Walking Tour takes 45-minutes or more. The tour starts at the War Memorial Natatorium, then head towards Diamond Head to the Tahitienne apartment. The traveler then weaves in between the Honolulu Tudor/ French Norman Cottages and other charming historic residential homes. At the end of the tour, the traveler will finish off with the Mediterranean inspired La Pietra School for girls. 1. The War Memorial Natatorium is significant as a major social and recreational local landmark and for its association with the history of competitive swimming. The swimming complex was rendered in a Beaux-Arts style and was finished in the summer of 1927, the first “living” was memorial in the United States. The property contains a 100 meter saltwater swimming pool, concrete bleachers that rises 13-levels high, and a main entryway that includes an elaborate sculpture and triumphal arch entablature. The memorial is dedicated to those from Hawai‘i who served in World War I. 2. The Tahitienne is a nine-story apartment building rendered in a 1950 modern, utilitarian style. The Tahitienne was planned and built by California architects Bob Fraser and Paul Hammarbarg. Local Architect, Edwin L Bauer, helped design the layout and interiors of the apartments. This building is associated with the commercial development of real estate in Hawaiʻi, and specifically with the co-operative apartments in Honolulu. There are approximately 50 co-operative apartments which appeared during the 1950s and early 1960s in Honolulu, which remain functioning as a co-op. 3. The Egholm Residence was built in 1926 in the Diamond Head Terraces subdivision. It is significant as one of the few examples of small cottages in the Spanish Colonial Revival style popular in Hawai‘i in the 1920s and early 1930s. The hipped red clay tile roof, stucco exterior and arcaded entrance are characteristic features of this style. The residence is the work of notable architect and builder Carl William Winstedt. The modest scale of this house is rare compared to the other palatial residences built in the Spanish Colonial Revival style during this time period in Hawai‘i. 4. The Honolulu Tudor/French Norman Cottages Thematic Group are made up of fifteen different residences, built between 1923 and 1932. These homes display a high degree of craftsmanship and design detail and include the work of several local architects and builders, including: Earl Williams, Hart Wood, John Morley, Theo Davies & Co., and J Alvin Shadinger. 5. The James JC Haynes Residence, built in 1926, is a two story, shingle sided house facing south. The house stands out as a well-constructed house, having been built by Lewers & Cooke, rendered in a distinctive colonial style distinguished by its high pitched, front facing gable roofs clad with cut shingles and closed eaves with 4″ beaded tongue and groove soffits. The house is also significant for its adaptation of this colonial revival form to Hawai‘i’s climate. Its easy access to the outdoors bespeaks a Hawai‘i architectural tradition for informal living. 6. The CW Dickey Residence, built in 1926, is associated with the well-known local architect, Charles William Dickey, and the development of the Hawaiian style of architecture. This cottage, with its prominent double-pitched hipped roof, became the prototype for numerous modest cottages built in the Islands during the late 1920s and 1930s. Through the use of graceful sloping roofs, overhanging eaves, extensive windows and screened openings, and lanai, Dickey said, “I believe I have achieved a distinctive Hawaiian type of architecture” (Honolulu Advertiser, March 14, 1926). The house appears intact and serves as a well-crafted, well-designed statement of Dickey’s development of an exclusive Hawaiian style of architecture. 7. Doctor Frank and Kathryn Plum Residence was constructed by Rudolph Bukeley in 1929. It is significant as an example of a Cotswold Cottage style residence constructed in Hawai‘i during the time period of the late 1920s and early 1930s. It well reflects the style with its romantic asymmetric massing, and its use of such eclectic and picturesque elements as its skewed gable, front bay window, wrought iron mock-balconet in the round arched gable vent, canted walls with their wound arched doors, double pitched roof, and shed roof dormers. 8. Built in 1923, Fred Harrison Rental Property is a one and a half story, shiplap sided, vernacular style house. It is a good example of a dwelling constructed as a middle class rental property. Although a modest house, it presents a distinctive appearance to the street with the curved, sweeping roofline; prominent bay window; double gable ends on the west side; and a front doorway that does not face the street. 9. The Adolph Egholm Kiele Avenue House is a single story, Spanish Mission Revival style cottage that was constructed in 1926. It features stucco walls and a red clay tile, hipped roof with overhanging eaves and exposed rafter tails. The house sits on a lava rock basement and is distinguished by its centered, outset, flat roofed front porch with its round arched openings. It is significant as a good exaple of a Spanish Mansion cottage built during the 1920s. 10. The Mrs. Josephine Ketchum Residence is a Craftsman-style bungalow built in 1931. It is significant for its architecture as an example of a Craftsman inspired house in Hawai‘i. The naturally-stained board and batten walls and use of heavy timbering are character-defining elements of the building’s design. In addition to these typical craftsman hallmarks, the house features the “Hawaiian” style, double-pitched hipped roof, which was very popular in the Islands during the late 1920s and early 1930s. This further accentuated the horizontal sense of the house, another typical Craftsman characteristic. The screened lanai and exterior bathroom door further fix its location near the beach, where a number of houses from this period featured such doors for use by beach goers. 11. The Folk Residence, Tavares Residence and Coconut Avenue Residence were built by John Morley for the Pacific Trust Company and are part of the Honolulu (made up of fifteen different residences, built between 1923 and 1932. 12. The Helene Morgan Residence is a single story, Hawaiian style duplex with a pair of double-pitched hipped roofs with overhanging eaves and exposed rafter tails. Presently, the house is a single family dwelling, but originally it was two separate laid out units connected by a passage. The duplex sits on a raised, post and pier, foundation with lava rocks at the base. 13. The Richard M Botley Residence was built in 1931. It is significant for its architecture as a good example of a Spanish Mission Revival house built in Hawai‘i during the period 1920-1931. It is characteristic of the style with its red tile roof and white masonry walls. The two-story, L-shaped house was designed by noted Honolulu architect Robert Miller. 14. Constructed in 1929, Hibiscus Place is a two-family Mediterranean Revival style residence. The builder, Charles Ingvorsen and his wife, Mary M. Ingvorsen, came to the United States from Denmark. He developed a number of smaller homes in the Diamond Head Terrace subdivision, and retained this property high on the slopes of Diamond Head for his family. Originally, the Hibiscus Place land consisted of approximately 17,739 square feet but, the property was subdivided in the 1950’s into three separate parcels. The current owner acquired and reassembled two of the three parcels of land into a single property that now consists of 12,495 square feet. 15. La Pietra, which was constructed in 1921, is an extensive two-story Mediterranean Style building built to resemble an Italian Villa. Its two stories are arranged in a hollow square containing a central rectangular patio. The central patio is lined on all four sides with arcades supported by cut sandstone Doric columns. La Pietra is significant as a representation of the kind of lifestyle enjoyed by the very wealthy in Hawaiʻi at that time as well as an example of Mediterranean architecture. The building was designed by prominent Chicago-based architect David Adler for Walter F Dillingham, a prominent Honolulu industrialist and businessman known as the Baron of Hawaiʻi Industry. 16. 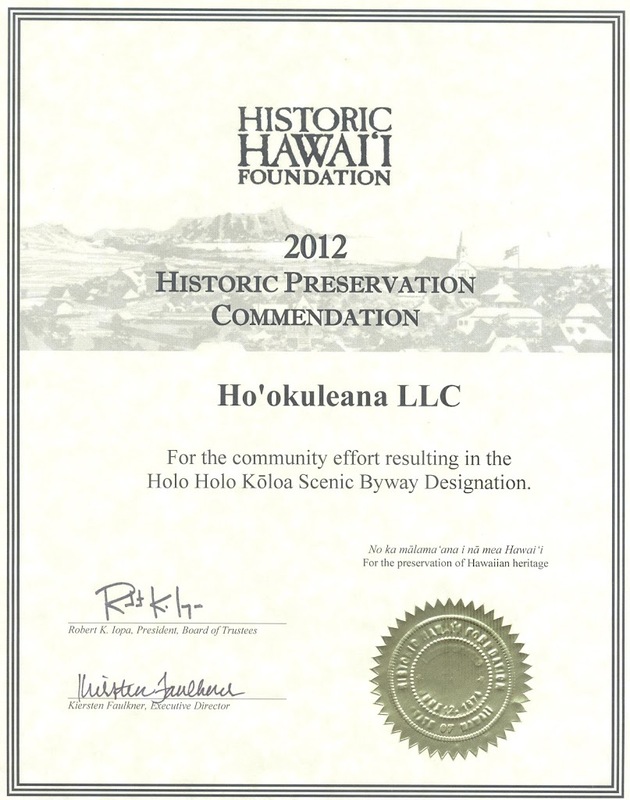 Kapi‘olani Park was dedicated in 1877 and is a recreational open space of 160 acres. Kapi‘olani Park has an extensive and varied history. The park began as a private preserve that transitioned over the years into the present-day iconic public park. Kapi‘olani Park is historically significant for its past association with indigenous Hawaiian culture and royalty. King Kalākaua envisioned the park as a place of recreation for all and named it after his famous Queen, Kapi‘olani. Long before the park was established, on Waikīkī/Kapiʻolani park area was the center of Hawaiian culture on Oʻahu. Agricultural cultivation, fishponds, coconut groves and indigenous settlements dotted the area. 17. The Diamond Head Lighthouse is a 57 foot white concrete pyramidal tower with a red roof. It sits seemingly on the side of a sharp cliff when viewed from seaward, and at night the light can be seen up to 18 miles by the mariner. It was first established in 1899 to guide mariners into the then budding port of Honolulu. Constructed in the Monarchy period, the lighthouse and accompanying buildings have not changed since 1917. The lighthouse itself is of the classic lighthouse design – a thick white tower with a barn-red pointed roof. Please remember to be respectful and considerate towards the owners of the Historic Homes you are viewing. Heed signs and respect the fact that each house is privately owned. Try not to loiter or display suspicious behavior around these houses. 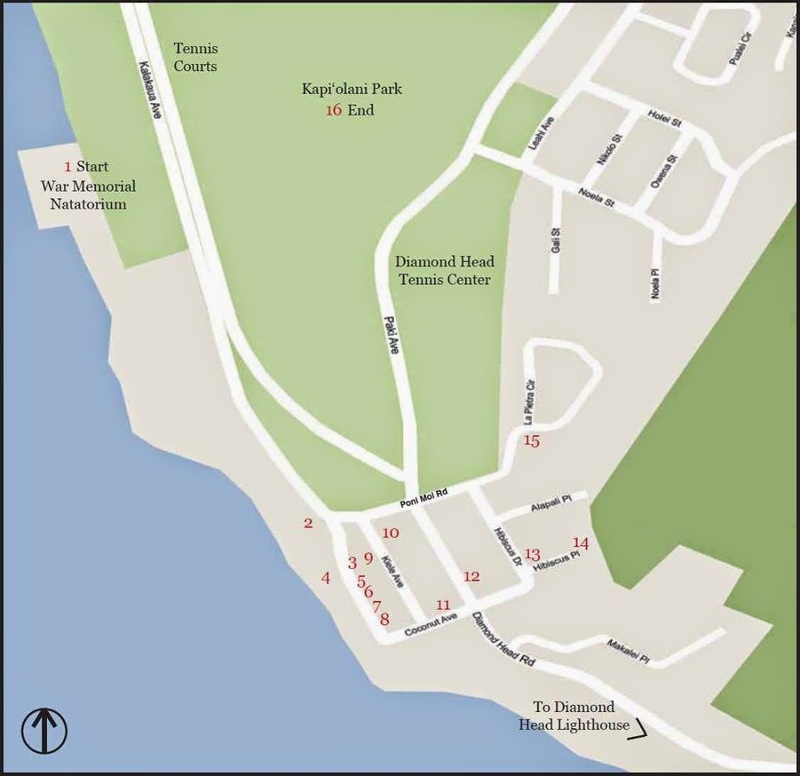 The image shows the location of the respective properties. (HHF) In addition, I have added other images in a folder of like name in the Photos section on my Facebook and Google+ pages. 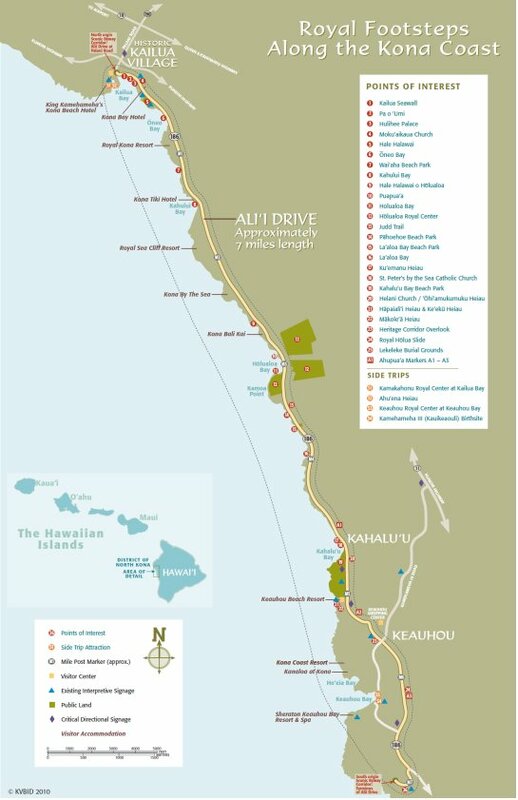 Historic Hawaii Foundation has developed a map and self-guided walking tour documenting twenty-five historic sites along a 3-mile route in historic Downtown Honolulu. Hawaii’s State Capitol building houses the offices of the Governor and Lieutenant Governor, offices of state legislators, and the chambers of the state House and Senate. The Capitol was constructed at the direction of Governor John A. Burns and designed by the firms of Belt, Lemmon & Lo of Honolulu, John Carl Warnecke & Associates and Architects Hawai‘i. The building opened in 1969. Like the Hawaiian Islands, the Capitol is surrounded by water, and the outer columns that rise from the reflecting pools represent Hawaii’s palm trees. The BWS building was completed in 1959 and was designed by famous architect Hart Wood in a local Hawaiian Style that combined elements of Asian and American influences. The entire building is constructed of reinforced concrete and the exterior was designed by renowned landscape architect Catherine Jones Thompson. The neo-Renaissance designed building by famed architects Walter Emory and Marshall Webb was home of the iconic Advertiser newspaper for over eighty years until the paper merged with the Star-Bulletin in 2010. Built in the Spanish Mission style, the historic ﬁ re station is considered to be haunted. It is located across from the graveyard of smallpox victims from the 1850s. Kamehameha III created Honolulu’s ﬁre department, making it the only one in America sponsored by royalty. Large fluted Corinthian columns grace the front of this classical revival-style building. A stained-glass dome is positioned above the lobby. Built as a governmental office building it continues to function as such today. Designed by Oliver Traphagen in the Renaissance Revival style, the building also known as Kana‘ina is currently used as the offices for the Friends of ʻIolani Palace. It was originally constructed to house Hawaiian governmental documents from before annexation based on a compromise with the US government. The 18-foot bronze statue was dedicated in 1883 to represent the famed unifier of the islands, King Kamehameha I. It was sculpted by Thomas Gould in Florence. The State Supreme Court and the Judiciary History Center are located here. It is the oldest government building in Hawaiʻi. Originally commissioned as a new royal residence by Kamehameha IV, Kamehameha V decided that it should become an administrative building. original grandeur, the building opened to the public as a historic site in 1978. Designed by New York architects York and Sawyer, this classic Mediterranean-style structure features large roof overhangs, shaded arcades, open interior courtyards, spacious porticos and two towers. It is still currently used as the Downtown Post Office. The Mediterranean/Italian Renaissance style building was designed by architect Lincoln Rogers. The building consists of three wings connected by a covered arcade and spans from Queen Street to Ala Moana Boulevard. It features an Art Deco lobby, painted high ceilings, and a classical cornice. A design collaboration between Charles W. Dickey and Hart Wood. The building is a unique fusion of eastern and western design elements that features a double-pitched hipped tile roof, a fourth ﬂoor lanai, water buffalo heads above the ﬁrst-ﬂoor windows, and a matte glazed terra cotta exterior. Located at 202 Merchant Street, it was constructed in the Richardsonian Romanesque style from locally quarried lava rock. It was originally built to be rented out as commercial and ofﬁce space; it maintains the same purpose today. Queen Victoria in England, Queen Emma raised $30,000 for the Anglican Church in Hawaii and to build St. Andrews Cathedral. Beretania was the Hawaiian interpretation for Britannia. Located on the original site of the Royal Hawaiian Hotel, the site was renovated and reconstructed in the late 1920s to become the Army and Navy YMCA. Designed by Lincoln Rogers, it features an open-sky courtyard; palladian windows; cast-stone detailing; iron-grille work and light ﬁxtures; and arched openings. It is now the home of the Hawaii State Art Museum. Churriguera -decorated column supports, a corner cupola and a low-rise, polygonal tiled roof. The building was designed by York and Sawyer with construction overseen by Emory and Webb. The ﬁrst structure in Hawaii designed completely by a woman. Julia Morgan, known for her work on Hearst Castle, designed the building in Spanish, Colonial and Mediterranean styles. It features a two-story loggia ﬂanked by the outer buildings. Built between 1870 and 1871, the barracks were home to the Royal Household Guard and are situated within the ‘Iolani Palace grounds. They were designed by Theodore Heuck. The barracks were relocated to the current position during construction of the state capital on the original site. Constructed for the coronation of King Kalākaua and Queen Kapi‘olani, the structure was moved and rehabilitated in the late 1900s. Most Friday’s at noon the Royal Hawaiian Band performs weather permitting. A Colonial Greek revival-style house was originally built for John Dominis, a clipper ship captain. It is most well known as the inherited residence of his daughter-in-law, Queen Lili‘uokalani. After the overthrow of the Hawaiian monarchy, the Queen lived in Washington Place until her death in 1917. From 1922-2003, the residence housed Hawaii’s governors. It is now a house museum and used for State events. The library’s construction was made possible through a gift from industrialist Andrew Carnegie. The Greco-Roman style building was designed by Henry Witchﬁeld and still serves today as the downtown branch of the Hawaii State Public Library. Designed by Dickey, Wood and others, this Spanish mission style building features open-to-the-sky courtyards, hand-painted ceiling frescos, 1,500-pound bronze front doors, and 4,500-pound courtyard chandeliers. The main entry faces King Street, behind a zig-zag pattern of planters (for security reasons) and the exterior of the building is complex, with deeply fenestrated windows and balconies of carved stone. The tower is particularly complex and features varied window treatments, open and closed balconies, loggias and cast-concrete grill work. This is considered to be the mother Protestant Church in Hawaii. Construction started in 1837 based on Pastor Hiram Bingham’s own design of a “simple New England church”. The structure is comprised of some 14,000 coral blocks, each weighing up to 1,200 pounds. The church continues to conduct services in both English and Hawaiian. Built by the Hawaiian Evangelical Association as a museum and archive to celebrate the 100th anniversary of the Protestant Missionaries in Hawaii. The city took over the building during the 1940s and it has since been converted to the City Hall Annex. It is an example of Georgian architecture. These are the oldest standing western structures in Hawaii. The timbers for the ﬁrst house were cut and ﬁtted in Boston. The initial house introduced New England style architecture to Hawaii. Originally utilized as housing for the missionaries, the buildings exist today as living house museums open to the public. 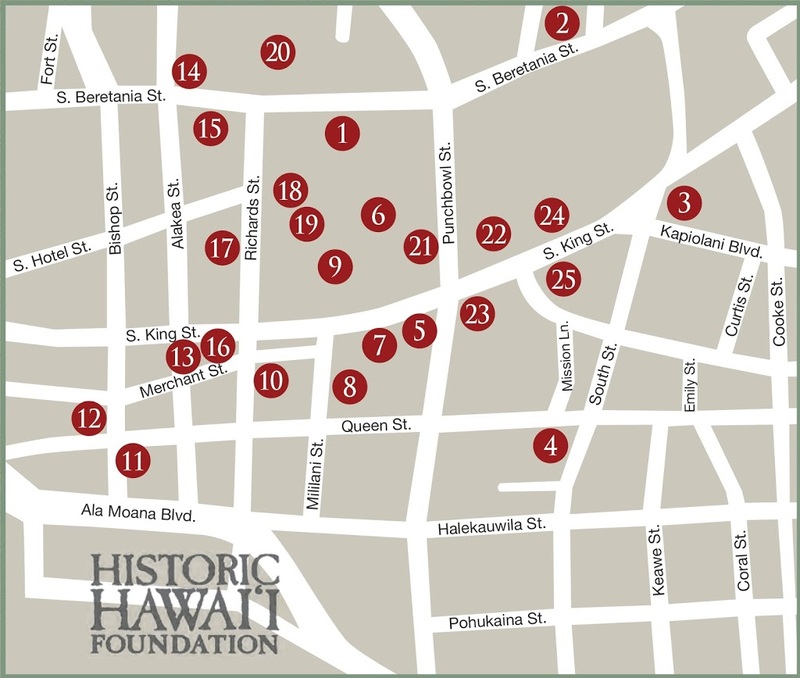 The image shows the layout of the Historic Downtown Honolulu tour from Historic Hawaiʻi Foundation. In addition, I have added other related images in a folder of like name in the Photos section on my Facebook and Google+ pages.